Try Charles' premium stock selection services free for 7 days. Check it out in real time! You will get actionable advice, trading ideas and email alerts. It was a roller coaster of a session on Wednesday that saw the Dow spike for almost 200 points from a report of the United States extending an invitation to China for high-level trade talks. Larry Kudlow told Fox Business the invite came after an overture from China. However, within a couple of hours, the bounce faded, and the blue-chip exchange rejoined other major equity indices into the red. The Dow and the S&P 500 clawed into the plus column, and the NASDAQ erased a big chunk of losses. Consumer Staples (XLP) were led by cigarette makers, lifting higher from reports about the FDA taking a hardline on e-cigarettes. Energy (XLE) names continue to rebound with crude oil, and healthcare keeps rallying with biotechnology names. All eyes shift to the holiday season news from FedEx (FDX) and Macy’s (M) that underscore the strength of the consumer and the role of E-commerce. FedEx will expand its U.S. ground operations to six days a week, year-round as the massive spike in holiday demand is anticipated to usher in a new paradigm for retail. In addition, management is looking to offer longer hours to existing employees and to hire 55,000 temp workers. Macy’s announced it will hire 80,000 temp workers for the holiday season, matching its announcement last year (the company eventually hired 87,000), but with a different composition. At least 23,500 of these workers will be needed at fulfillment centers, up from 5,000 last year. Apple (AAPL) made a lot of noise with its product event, which saw an array of new phones, including its most expensive model ever (iPhone XS Max’s). Historically, the stock does fairly well in the 60-days after these events. The company stock continues to reflect disbelief that management can keep extracting higher prices for a smartphone. The company continues to focus on margins over volume. Perhaps, it will hit a brick wall one day. If Wall Street valued Apple like Amazon (AMZN), the stock would be changing hands at significantly higher levels. For the most part, the economy continues to enjoy the moderate or modest expansion, but two issues are causes for concern. More businesses are complaining about labor shortage or labor skills gap and worries over a trade battle are mounting as well. Firms reported the continued expansion of business activity. Retailers, manufacturers, and staffing firms cited year-over-year increases in revenues and sales. Labor markets remained tight amid little net hiring. Outlooks continued to be positive. The regional economy expanded at a moderate pace, and labor markets have remained tight. Input price increases have remained widespread, while firms' selling prices have decelerated somewhat. Economic activity continued to expand at a modest pace. With tight labor markets, wages grew moderately despite incremental job growth. District economy grew at a moderate pace. Labor markets tightened, and wage pressures were noted broadly. Cost pressures among manufacturers and construction firms continued, especially for metals, construction materials, and transportation. Stronger confidence in the economy. The regional economy grew moderately in recent weeks. Port and transportation activity remained robust. Business travel and tourism were also strong throughout the Fifth District. Labor demand strengthened, and employers continued to report difficulties finding qualified workers. Labor markets remained tight, and wage pressures increased for some firms. Retail sales improved further. Manufacturing activity continued to grow. Wages and prices rose modestly, and financial conditions improved slightly. Overall crop yields appeared set to forge a new record. Manufacturers facing higher input prices reported passing those costs along to their customers. Agriculture contacts estimated that the majority of the soybean crop has not yet been priced, leaving farmers exposed to current market conditions. Employment grew strongly, despite continued labor constraints. Hiring demand was robust, and wage growth was moderate to strong. Manufacturing activity increased, but contacts in manufacturing and agriculture remained concerned about the negative impacts from trade restrictions. Manufacturing contacts noted that recent trade developments had led to higher input prices and lower capital spending plans for some firms. Prolonged weaknesses in the agricultural sector increasingly impacted farm borrower finances. Manufacturing and service sectors sustained a healthy pace of growth, while activity in the housing and energy sectors was flat to down. Retail spending accelerated, as did loan demand. Wages and other input costs rose, but firms' ability to pass these increases on to customers was limited. Conditions in the labor market tightened further, and price inflation increased moderately. Sales of retail goods picked up moderately, and activity in the consumer and business services sectors edged down slightly. The Goldilocks economy looks even more perfect this morning after the Consumer Price Index came in at a very benign 0.2% headline and 0.1% ex-food and autos. 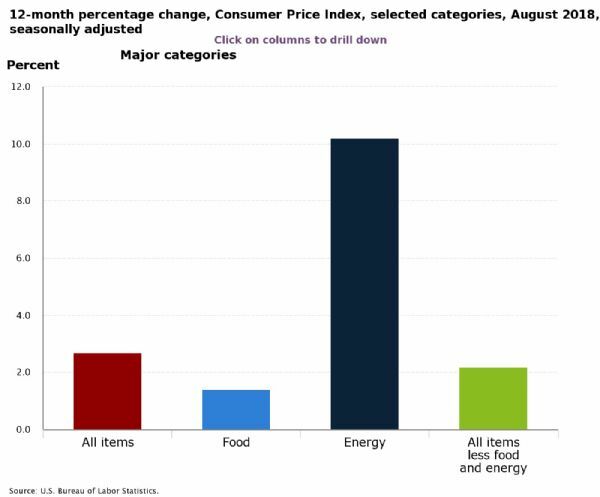 Year over year, energy remains hot, but all other items are reasonable and shouldn’t alarm the Fed. So, the free market solves the problem of nicotine delivery via tobacco causing cancer and the FDA cracks down on the ones who solved it. I just love freedumb. Government ruins everything. Charles, we thank you sir, & All at FBN. USA CITIZENS are voters, and we support president Trump 100%. It is the President TRUMP MARKET &GROWTH, DUE TO President Trump cutting regulations, &tax cuts, & also his TRUTH about nonpayment by so called allies. Please Keep reporting the FACTS, & TRUTH, we TRUST Charles Payne's reporting & FBN. LIFE is great be invested long.. Submitted comments are subject to moderation before posting. 4/12/2019 9:34 AM CAN BANK INVESTORS GET SOME SUGAR? 4/8/2019 9:30 AM THEY MISSED IT: NOW WHAT?